You put gas in your car to keep it running, but what keeps you fueled on the road? 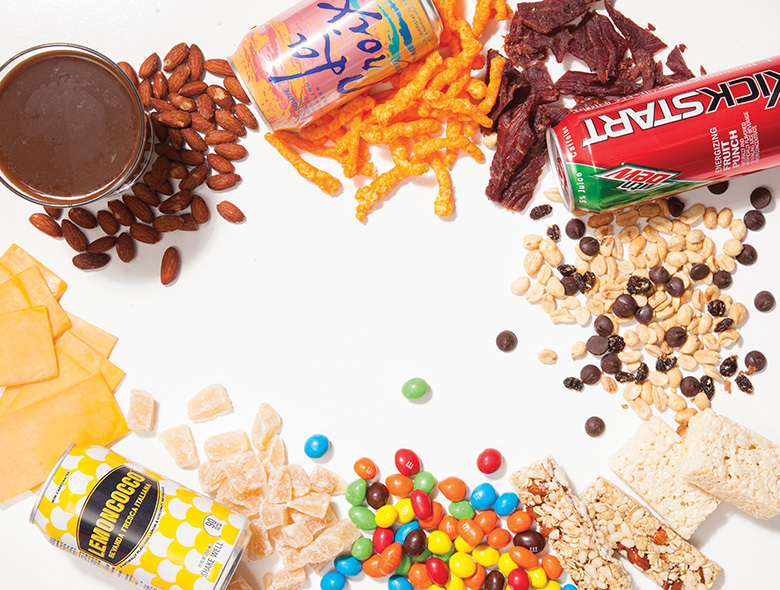 Our road-trip writers share their favorite snacks. There's no more appropriate place to eat beef jerky. Wild Things’ healthy and sweet (and local) Skinny Dipped Almonds have just enough chocolate to be dangerous and are easy to eat while driving. I’m also a fan of the adult-palate-friendly Jones Soda Lemoncocco beverages, which give a hint of European sophistication. My favorite road snacks are Honeycrisp apples eaten with slices of sharp cheddar cheese and dry-roasted almonds. And to drink, a tall cold-brewed coffee. Cheetos (puffed preferred, crunchy shown here) are easy to hold and eat (and don’t forget the napkins to avoid orange hands). I also like to pack a few cans of grapefruit LaCroix water to stay hydrated between stops at diners and to balance out the Cheetos. Beef and pork jerkies (especially the spicy Singaporean version from Mei Jan Hong, in Aberdeen Centre in Richmond, British Columbia) are perfect on long stretches of road. And coffee—we always pack insulated coffee mugs with strong seals (Klean Kanteen is our favorite brand) so we can buy coffee that stays hot until we want to drink it. I am kind of a minimalist; I like to mix together my own trail mix, with Dang coconut chips, chocolate chips, peanuts and raisins. I also like to stock up on beef jerky, granola bars and Rice Krispies treats. And my favorite road drink is Mountain Dew Kickstart. Though ginger chews could be considered a snack, I really take them along to remedy any cases of car sickness (myself or my kids’). Peanut M&Ms are the perfect combination of straight-up sweet, plus rich and chocolaty. And the nuts offer a bit of protein to keep you from experiencing a sugar crash. Also, water bottles for everyone, because anything with a flavor gets old after a while or too gross to drink once it’s warm.